Thirty-one years ago today, in the basement of our parish church, I met the girl at left, who took a chance on a very random kid, thereby changing his life forever. 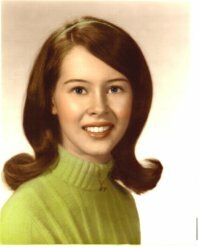 This photo was taken just a couple of months before, when she was still only 15. We married seven years later, in October, 1976. My devotion to Carol Ostruska Duntemann is well known. Our trick? We were friends before we were lovers, and we became and remained best friends in the face of all the world could throw at us. So we will remain, as long as we will liveand maybe longer. So Napster gets a reprieve from the injunction intended to shut it down. I think at this juncture that the recording industry should meditate on the unwelcome fact that Napster is its last chance. I took a look at some of the file-swapping mechanisms warming up in the bullpen, and however bad Napster may seem to the record moguls, everything else is way worse. Think of it this way: Napster is "shaped" like a business. The prices are all zero, but that's less important than the way things are arranged. If the record guys chose to, they could work with Napster (or even buy it) and evolve it to become the ultimate online song store. Gnutella, on the other hand (which I've tried) and FreeNet (which I haven't tried) are shaped nothing at all like a business. Furthermore, they are by nature uncontrollable, and if they catch hold in the next year or so, the music industry as we know it is over. The record honchos are in a bad spot, and in some respects I sympathize with them. Secure audio content is impossible without retiring the current audio CD format, which is just as impossible. As long as CDs are issued that can be played on hundreds of millions of stereo systems, there will be "free" music floating around the Net. But without physical CDs (and the record stores to sell them) we don't have an industry. This may not be an altogether bad thing. The current winner-takes-all system is completely unfair to small bands, who can make their own CDs but can't get them into distribution. All the money flows to a handful of bands, with the record labels taking their cuts. Interestingly, what might be the outcome of all this is that indie bands might sell individual tracks that are protected somehow (or at least steganographically "watermarked") and never shipped on standard physical CDs. If they make them cheap enough (and I'm suggesting a quarter per, truly!) they'll sell plenty, especially if they work out some sort of deals with specialty webcasters. And yes, any protection scheme will be broken, but I'm not sure that with sufficiently cheap music, people will even bother. make it cheap, make it easy, and the money will come. The days of the horizontal-appeal, mega-rich mega-star may be numbered. Maybe that means that my kind of music (typefied by bands like the Tokens, the Association, and the Peppermint Trolley Company, and folkers like David Buskin) might be able to get some play, and even some money. Let us pray. The scanner works very well, and I had a bad need for it: My father took a huge number of 35mm slides over a 30 year period, and we have no easy way to look at them anymore. 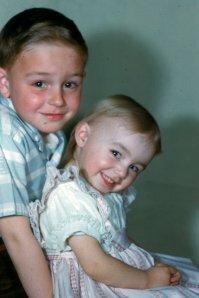 The photo at left is typical, of my sister Gretchen and me in the summer of 1960. Resolution and quality are extremely high, although it takes about fifteen seconds per slide to get a finished scan. The unit comes with software for correcting color (something I could really use on older slides) but I haven't mastered it yet. My intent is to get them all onto a CD, so family members can have them all without needing a Carousel projector or one of those screwy roll-down screens. Highly recommended! I heard this morning that the RIAA finally succeeded in getting an injunction against Napster. So I cranked it up one last time and took a look around, just to remember what the phenom was like before it shuts down (I would guess for good) this Friday. Although I'm no fan of the RIAA, Napster was clearly on the other side of ethical practice. And I find it interesting that there was a great deal more interesting music when I last looked, back sometime in mid-May of this year. Oldies and classical were much more prevalent back in May. Why? All I can figure is that the RIAA's scare/guilt campaign worked, but only on people like me. The people who like Metallica and Dr. Dre stuck with it. Old guys like me bailed. This says something about something, but don't ask me what. After more than a year of rewriting and polishing, I'm sending The Cunning Blood off to Time-Warner Aspect today. This is the SF novel I began in late summer 1997, and finished on Good Friday 1999. My original title was No Way In Hell, but I heard on good authority that certain bookstores won't shelve a book with the word "hell" in the title, regardless of its context. (Here, it's the name of a planet.) Hell, (as it were) why kill chaces for additional sales, however slim? Besides, the main character in the story is a distributed nanocomputer consisting of hundreds of millions of bacteria-sized nanomachines that live in the human bloodstream. It's hard SF in the grand tradition: gadgets, action, interesting places and ideas. If you ever enjoyed Larry Niven you'd like it. It sounds a little odd for a veteran author and publisher not to able to find a publisher for a completed and polished book, but the wall between genres is light years high. My computer books count for nothing in the SF world, alas. Hey, I'll post a chapter or two here one of these days. Watch for it, and bug me if you don't see it in another month or so. I've been wanting to get a Web diary back in play for eight or nine months now, ever since it was clear that Visual Developer Magazine was sinking, and VDM Diary sinking with it. I decided to set the idea aside until I was ready to completely reconstruct my personal page, using Dreamweaver 3.0. Finally, I've had the time to sit down and get familiar enough with Dreamweaver to put a "homely" diary format in place. I'm no artist, but Dreamweaver allows me to do about as good a job as any plodding technician can do. As I learn, the format will improve. I hope.